What is a Denture Repair Kit? When is a repair kit not enough? How can I avoid breaking my dentures? You crunched just a little too hard and now your denture has cracked. It’s coming a little loose and now your mouth looks conspicuously broken. You call your dentist, but this isn’t a bad enough problem to warrant an emergency dental visit. The only quick solution is to find a good denture repair kit. So, let us help you with that. Easy to use, and reasonably priced – this is the D.O.C. Repair-It kit. We only recommend you use this kit for emergency repairs and not as a permanent solution. For less than $7, you will not find a better and quicker solution to your broken or cracked dentures. Dentures are pretty fragile. A lot of things can cause them to fracture and break if you’re not careful. Even dropping them just an inch or two can cause a major fissure. The materials aren’t built to last forever, either. The longer you wear a denture, the more likely it will need a repair. The most common cause of denture issues is a bad fit. As you bite down on things and chew, wear and tear is placed on your dentures. Microfractures begin forming that aren’t visible until they become prevalent enough to cause a full fracture. If the upper and lower sets don’t match up right, you could be putting too much bite force on one area of the denture. Eventually, all of this leads to a large break that needs to be fixed. Over time, dentures become worn down and much thinner than the original set. Worn dentures can also lead to changes in how you bite and chew your food, unevenly distributing force. This can cause cracks and breaks from stress to that area of the denture. Over time, these will also change the fit – it will no longer be as perfect as it was when they were new. This can harm not just the denture but your gums as well. There’s got to be something you can do in the meantime to prevent the whole tooth from falling out or making you look bad in those impromptu selfies your grandkids are constantly snapping with you. After all, you’re a fashionable and hip grandparent. You’re G-Dog. No way will you let their Meemaw or Nana win the Cool Grandparent award. The good news is that they do have some options for a quick temporary fix. The DIY (Do it Yourself) industry has expanded from arts and crafts and home hair dyes to the dental industry. If you need a quick denture patch job to hold you over until your appointment, consider grabbing a denture repair kit. Dental repair kits are a great way to hold your dentures together while you wait for an appointment for a proper repair from your dentist. They will contain a glue-like material that you can apply to a crack to bond it together. There are a few important things to keep in mind. First, you should never, never, never, under any circumstances use superglue to repair your dentures. This material doesn’t bond with dentures. Not only can it damage your dentures, but it also inflames your gums. It also tastes terrible and dissolves in water. Next, be sure to check the label and make sure it is FDA approved for dental work. We recommend the D.O.C. Repair-It Advanced Formula Dental Repair Kit, which we will cover in more detail later. Dental repair kits often contain several teeth in different shapes and sizes in case you have a chipped or broken tooth that needs a little more help than simply holding a fracture line back together. The Dentist n Call repair kit is built to fix breaks, mend cracks, and replace loose teeth. One kit can make 3 repairs. It is safe and easy to use. If you are careful to follow the enclosed instructions, this can last for a long time if you aren’t able to make it to the dentist. Remember that dental repair kits are not meant to be permanent solutions. They do not take the place of your dentist and are not meant to permanently fix dentures. Relying on this solution will not fix the problem that created the fracture in the first place and to avoid further breaks, it is critical that this is properly repaired and your dentures get refitted to fix the bite force problems. Even the best dental repair kits are made so that you can avoid awkward and embarrassing situations in the time between a break and a dental appointment. Breaking dentures is really stressful. It means adjusting the way you eat to prevent biting down on the weaker, broken area. This will, in turn, weaken other areas and lead to further damage and more broken areas. It also causes increased stress and anxiety emotionally. No one wants other people to see those embarrassing breaks, but it’s hard to remember to conceal your teeth, cover your smile, and avoid showing those teeth. You’re not used to thinking about that. Repairs also get pretty expensive. You have to buy a repair kit for a quick fix, only to turn around and spend an additional $300 on average, sometimes more, with a dentist to get a more permanent solution. Dentures break enough due to factors beyond our control without us making it worse. 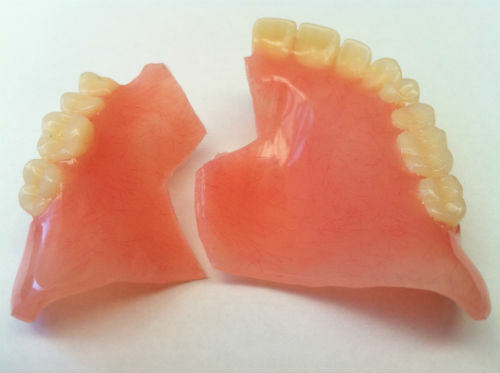 How can we prevent breaks and extend the lifetime of dentures? As awkward as it can be, especially when you’re eating out and not at home, the simple act of rinsing dentures after meals can extend their lifespan. Removing those food particles hiding deep in your dentures prevents them from breaking down the enamel material and causing bacteria build-up that wears down dentures. Brush your dentures. Treat them with the same care as teeth. Use a soft-bristled toothbrush and toothpaste that doesn’t contain any whitening agents or bleach. Most of those use materials that can break down the outer layer and contain material that can be abrasive to dentures. Soak your dentures overnight. A lot of people grind their teeth while they sleep, and this can loosen and break down dentures. Also, sleeping often dries out mouths and lowers saliva productions. Keeping dentures moistened extends their life.